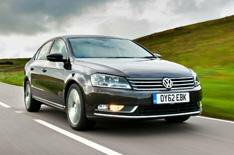 Volkswagen Passat Highline revealed | What Car? The Volkswagen Passat range has been tweaked with the arrival of new Highline trim, which replaces the current SE model. Adding to the SE's equipment list, the Highline brings a touch-screen sat-nav system, front and rear parking sensors, dual-zone climate control and 17-inch 'Sao Paolo' alloys. The touch-screen sat-nav was previously a 750 option, and includes a full-colour screen and traffic monitoring. It's also compatible with MP3 players and Apple's iPod. Passat Highline versions also get cruise control, a flat tyre indicator, auto-dimming rear-view mirror and a six-way electrically adjustable drivers seat with lumbar support. The Passat Highline is available with a range of engines, including 120bhp 1.4-litre and 158bhp 1.8-litre petrols, and 104bhp 1.6-litre and 138bhp 2.0-litre diesels. Gearbox options include five- and six-speed manuals, and six- and seven-speed DSG semi-automatic 'boxes. The additional equipment represents a total value of 1680, but the Passat Highline costs just 500 more than the SE it replaces. Prices start at 20,970 for the 1.4 petrol, and the car can be ordered now.